Sweet Jaysus there hasn't been a Making A Mark article on IADW in ages (I think DC has had at least three Crisis in that gap, if not one continual one). Following on in the tradition of giving an insanely talented artist some IADW brag-space. Today goes to Tu Bui, a mobile game artist, who started drawing "physically challenged Ninja Turtles and X-Men" with a #2 pencil as a youngster, and now as a pro... well as you can see, he is still drawing the X-Men. 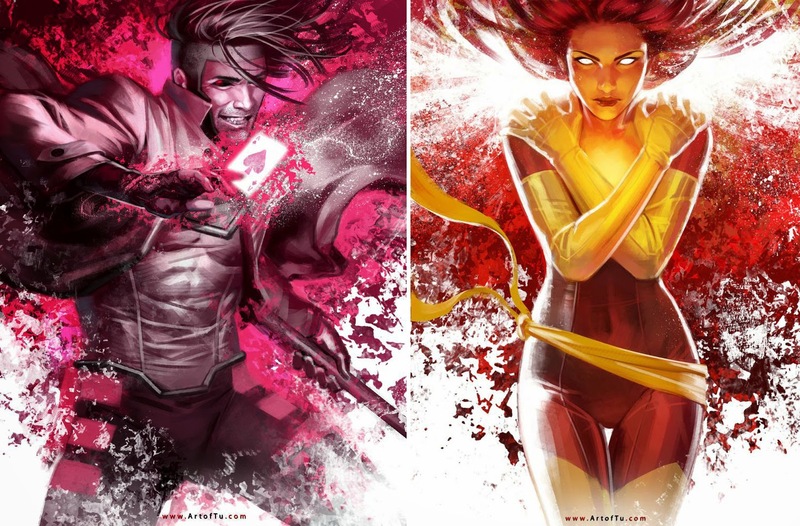 Jean Grey rarely takes a bad pic, but hot damn it's great seeing Gambit in his classic duds, still looking like he did at the height of his X-Fame. While the characters in each shot are amazingly detailed in all Tu's digital artistic might, what makes this series so strong is each poster stays within a set range of colours, relative to it's star. A big fan of martial arts culture, including muay thai, boxing and brazilian jiu jitsu, Bui currently resides in San Jose with my wife and twins, Andon and Arden. Time for more X-Men! speaking of making the mark Dan i'm glad you liked my retro Martian Manhunter oil painting. i actually just finished up something not even an hour ago with this wonderfully relaxed sunday i'm having. i'll post it first thing tomorrow morning i think you'll dig that one to. Holy impressive lighting Professor X! He surely knows his digital chops. I'm sold. I was sold when I saw Gambit Random. Instantly I was like, damn I've gotta find out more about this guy! Not just the lighting on that one, but the muscle definition and facial expression. He really loves that character.